Eat It or Avoid It? Once you have a child who has severe food allergies and have experienced how hard it can be to keep that child safe, you naturally want to do anything you can to keep your next child (or children) from getting food allergies, too. This concept of stopping an allergy before it starts is known as primary prevention. As a pediatric allergist/immunologist I get a lot of questions about this: Should Mom avoid highly allergenic foods while pregnant or breastfeeding? If and when should you try feeding these foods to the baby? Is it best for Mom to avoid these foods and also delay letting the baby try them until he or she is older, or will avoidance actually increase the chances that allergy will develop? When you are pregnant good nutrition is extremely important, and you should continue to eat all of the nutritious foods that you usually eat. As a general rule, avoiding highly allergenic foods during pregnancy is not recommended at this time. In particular, whether a pregnant woman avoids cow’s milk or egg does not seem to make a difference in whether her child develops allergies. With respect to peanut, however, more studies are needed before we can make a conclusive recommendation. While some studies have shown that eating peanuts during pregnancy increases the baby’s risk of developing peanut allergy or asthma, other studies have shown the opposite to be true. It is important to note that most of the studies on this issue have important limitations, such as relying on mothers’ memories of their diets during pregnancy months to years afterwards. Until there is clear evidence one way or the other, pregnant women who do not have food allergies themselves do not need to avoid highly allergenic foods. Just like when you are pregnant, when you are breastfeeding you should continue to eat all of the nutritious foods that you usually eat. Avoiding cow’s milk and egg while breastfeeding is not recommended at this time. Similar to peanut in pregnancy, data are inconclusive about whether you should avoid peanuts while breastfeeding, and at this time no recommendation can be made. This does not mean that it should be avoided, just that the information is not clear enough to be able to recommend one way or the other. Please note, however, that if your baby has severe eczema or is showing signs of possible food allergy (such as hives, excessive vomiting, failure to thrive, extreme fussiness during most nursing sessions, coughing/wheezing with feedings, or other similar issues), you should speak to your allergist about your concerns before possibly changing your diet. Early signs of problems – If your baby has poorly controlled eczema, is showing signs of possible food allergy (see above), has already had reactions to other foods, or has a known food allergy, you should speak with your allergist about a personalized plan for food introduction. Elijah, age 1. Photo courtesy of KFA member ehart. 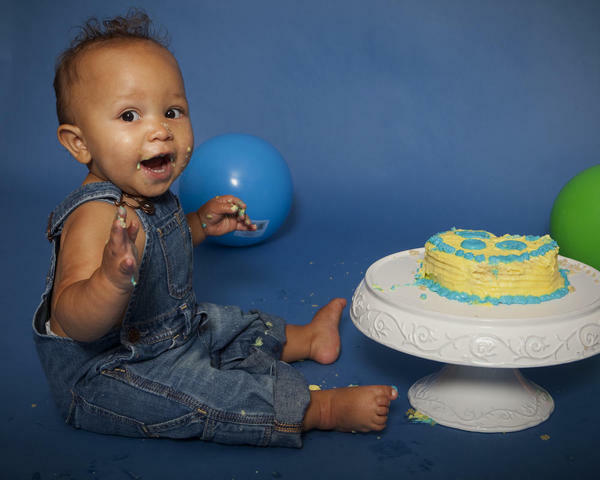 Try other foods first – The first foods that you give your baby should not be the most allergenic ones (i.e. dairy products, egg, soy, wheat, peanut, tree nut, fish, and shell fish). Start with other single ingredient foods, such as rice or oat cereal, yellow and orange vegetables (sweet potato, squash and carrots), fruits (apples, pears and bananas) and green vegetables. Once things are going well with these other foods you can then start to introduce the allergenic foods. Go slowly – Introduce just one food at a time, and then wait three to five days before trying the next new food (whether it is a highly allergenic food or not). Choose the right time – When you are ready to introduce a highly allergenic food, pick a time when you’ll be at home and you will be able to watch your baby closely for any signs of reaction. Along these lines, it may be better to do this earlier in the day and not right before a nap or bedtime. Do not try these foods right before you need to leave the house to go somewhere, such as to drop the baby off at day care or take your other children to school! Although many babies react the first time they eat a food, you should be cautious for the first two or three times that your baby tries an allergenic food. After that you can relax knowing the chances of a reaction are extremely small. Start with a small quantity – Don’t give your baby a full serving of a highly allergenic food on the first feeding. Start with a just a little. If there does not appear to be a reaction, then you can gradually increase the quantity during the next few feedings. Use nut butters, not nuts – Never feed nuts to a baby. Babies can choke on nuts. To introduce nuts into your baby’s diet, use nut butters or pastes. Does it matter which allergenic food you try first? No. Unless your doctor has advised otherwise, the order is completely up to you. For additional information, the American Academy of Allergy, Asthma and Immunology has a new patient brochure you can download: Preventing Allergies: What You Should Know About Your Baby’s Nutrition. Todd Green, MD, FAAAI, is an allergist/immunologist in the Division of Pulmonary Medicine, Allergy and Immunology at Children’s Hospital of Pittsburgh, Director of the University of Pittsburgh Medical Center Allergy/Immunology Fellowship Program, and an Assistant Professor of Pediatrics at the University of Pittsburgh School of Medicine. In addition to serving on KFA’s Medical Advisory Board he is also on the Board of Regents of the Pennsylvania Allergy and Asthma Association. Dr. Green attended medical school at the University of Pittsburgh School of Medicine. He completed his residency at The Barbara Bush Children’s Hospital at Maine Medical Center and his fellowship at Duke University Medical Center. He is Board Certified in Allergy/Immunology and Pediatrics.